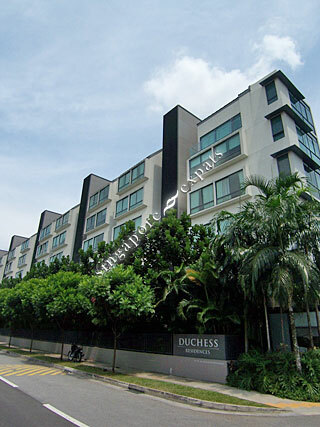 DUCHESS RESIDENCES is located at 102 - 110 DUCHESS AVENUE in district 10 (Bukit Timah, Grange, Holland) of Singapore. DUCHESS RESIDENCES is a 999-year Leasehold Condo development consisting of 120 units. DUCHESS RESIDENCES is completed / TOP in 2011 (estimated), developed by DUCHESS WALK PTE LTD (UOL GROUP LTD, LOW KENG HUAT LTD). Educational institutions like HWA CHONG INTERNATIONAL SCHOOL, BLUE HOUSE INTERNATIONAL SCHOOL, THE EXPERIENTIAL LEARNING CENTRE, NANYANG PRIMARY SCHOOL, RAFFLES GIRLS' PRIMARY SCHOOL and HENRY PARK PRIMARY SCHOOL are near to DUCHESS RESIDENCES. DUCHESS RESIDENCES is accessible via nearby TAN KAH KEE, SIXTH AVENUE and FARRER ROAD MRT Stations. Good 999 years development within 1km to Nanyang Pri School. Luxurious resort living with great landscape. Close to amenities. Great for family living. Quiet surrounding and in prime location. Very quiet, peaceful and amazing place. Has a great pool, private lift and gym. Small, cosy and friendly condo community.